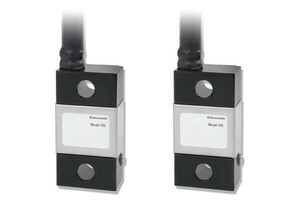 The VPG Transducers brand of Vishay Precision Group, Inc. (NYSE: VPG), global designers and manufacturers of standard and custom force, pressure, torque, load, tension and weight sensors, today announced the global market introduction of its Model 182 extensometer, a specialty high-performance strain gage-based force sensor, expressly designed for industrial, EN15000 and EN280 compliant off-highway vehicle and equipment safety applications. The Model 182 extensometer accurately measures deformation, or changes in the length of a solid structural body, with a 500 μƐ full-scale sensing range and necessary redundancy for EN15000 and EN280 compliance in safety applications. Its robust design consists of a high-quality strain gage sensing element, housed in a highly corrosion resistant coated alloy steel, with mounting via two bolt holes (M10 12.9 required). Units are IP67 rated for dust and moisture protection, ensuring their continued reliability and repeatability in demanding environments. Multiple output choices, including mV/V, 4-20 mA and 0-10 V, are available as standard, along with alternate connection options. For vehicle safety applications, customers can select from either a CAN Open or SAE J1939 protocol, with further choice of a DT or M12 connector. Please consult VPG Transducers for details. Typical applications for the Model 182 include off-highway vehicle, telescopic handler and lifting machinery measurements. The extensometer is especially well-suited for applications where safety and device stability are of critical importance for operator injury risk mitigation and prevention, including where stringent vehicle compliance with EN15000 and EN280 standards may be required. It may be further specified for the accurate onboard vehicle machinery and chassis safety monitoring of construction equipment, scissor lifts, boom lifts, forklifts, and materials handling equipment. Here, the extensometer effectively supports various lifting and loading scenarios, including overload measurements. For detailed specifications, pricing, applications engineering support, or additional information, please visit www.vpgtransducers.com. VPG is an internationally recognized designer, manufacturer and marketer of: components based on its resistive foil technology; sensors; and sensor-based measurement systems specializing in the growing markets of stress, force, weight, pressure, and current measurements. VPG is a market leader of foil technology products, providing ongoing technology innovations in precision foil resistors and foil strain gages, which are the foundation of the company’s force sensors products and its weighing and control systems. The product portfolio consists of a variety of well-established brand names recognized for precision and quality in the marketplace. To learn more, visit VPG at www.vpgsensors.com.